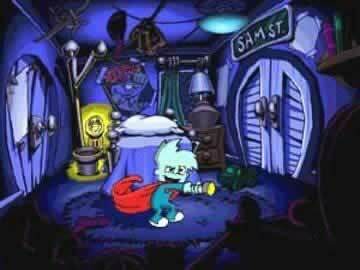 Pajama Sam - No Need to Hide Game - Download and Play Free Version! Journey with Sam into Dark Land to meet new friends and defeat Mr. Dark! 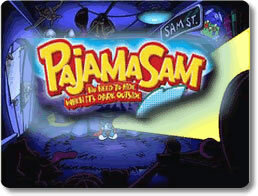 Pajama Sam is afraid of the dark but determined to confront his fear and defeat Mr. Dark. Help Sam journey into his closet and farther into a magical land full of adventure. Meet talking trees, funny carrots, a helpful boat named Otto and more friends that will help you on your quest. 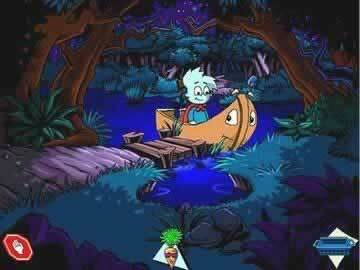 Pajama Sam is an open ended adventure that won't be the same when played over again. Items to be found are hidden in different spots and new areas open up to players. Kids will have a great time clicking on the fun, cartoon environment just to see what kinds of neat things will happen. Kids also learn how to think critically and solve problems to help Sam out on his adventure. Stuck in the game? This video shows the entire game being played from start to finish!